If persistence is the key to success, Alex de Parry is certainly entitled to some. He has exasperated, astonished and at times enraged the Germantown neighborhood with his efforts to develop his properties there. Looked at from one perspective, he has accomplished a lot. The South Fifth Avenue area didn’t have a neighborhood association before he began submitting plans for a massive development there, and they didn’t have a historic district either. Now the neighborhood seems to have discovered itself and become cohesive, there is a historic study committee, and the area is definitely on the map with a name that it didn’t have before (Germantown). But after nearly two years of trying, de Parry still doesn’t have a project. Last night (October 12) he tried once again to reconcile the neighborhood to a plan for redevelopment. Trouble was, most of the neighborhood and historic preservation advocates who have been tracking this process were boycotting the meeting. When I arrived at Conor O’Neill’s Celtic Room on Main Street for the 5:30 meeting, de Parry’s attorney Scott Munzel was trying to get the reporter for AnnArbor.com (Ryan Stanton) to leave because it wasn’t a public meeting. But Munzel shortly left, which was a good thing since reporters (Stanton, AnnArbor.com’s business reporter Paula Gardner, and I) were most of the audience. There were two “observers” from the Germantown association who declined to answer questions or to participate much. Otherwise, it was a golden opportunity for journalists to ask the questions. So if the houses are to be preserved in their entirety, how do we get a project with multiple housing units? First, some of them will have to be moved up to the 19′ setback that one or two already have. (Dziurman has already inquired about this at the state office – difficult for a historic building, but doable.) Then two large multifamily buildings would be erected behind the houses. The architect emphasized use of appropriate window geometry, etc. to make these compatible. Also each of the houses will contain several units (as they do now), plus some “garden apartments”, meaning apartments set into the lower level (aka basement) of at least some houses. All this is very much under development, since Dziurman only just came onto the job. But de Parry says that there will be a total of thirty to fifty units, with lots of efficiencies, and some one, two, and three-bedroom units. He is aiming for rental “workforce” housing and says there is a lot of demand for efficiency apartments right now. At the meeting and in subsequent emails, he has indicated that his picture of future tenants is a mix of young professionals and older empty-nesters who will appreciate being near downtown, but not the more affluent people who are more likely to purchase condominiums downtown. He has also ruled out six-bedroom apartments aimed primarily at students, as were mentioned in some earlier plans, saying that he heard too many objections to those. “I’m not aiming to change the demographics of the area.” All this plus underground parking, stormwater reservoirs and LEED-certified buildings (but geothermal may not be in the picture any more). There are a couple of questions that bear on the success of this new reborn concept. First, can de Parry regain the trust of the Germantown neighborhood? It has been a rocky ride. The trajectory of the many different projects all called City Place is pretty tough to follow. As helpfully listed recently by the Ann Arbor Chronicle, the story began with a request for “conditional zoning”, rejected by the Planning Commission on January 15, 2008. This was followed by the first Planned Unit Development proposal on May 20, 2008, also rejected by the PC. As most know, PUD proposals are popular development tools for making the most of a parcel, and that early one was huge. As explained by the Chronicle, it would have had 90 units with 164 bedrooms. This was considered by the nearby residents to be doing violence to the very fabric of their neighborhood, and as we reported some months ago, a neighborhood organization was formalized in January 2009, after an early failure to get council to approve a historic district study committee, and just as council voted down de Parry’s second attempt at a PUD. But de Parry came back with an (apparently deliberately) obnoxious so-called “by right” development based on the existing R4C zoning. This ball got kicked around for a while till council postponed action on it in July at de Parry’s request, though that resolution gave him the right to bring it back with a month’s notice. The idea was that he could continue negotiations on a PUD (clearly his true wish). Weary of the need for constant vigilance, neighborhood activists proposed (via CM Mike Anglin) a moratorium on any development in R4C zoning districts. But in a surprise, council instead approved a historic study committee with a limited area. This came with a moratorium on demolition in the 5th Avenue block under contention. Suddenly, de Parry responded by bringing back the “by right” site plan which council approved grudgingly on September 21. This move elicited a remarkably critical editorial from AnnArbor .com and exasperated head-shakes from everyone else. So – shoosh. Can we talk? Here’s hoping that de Parry’s latest volley of historic preservation is for real. Obviously he still doesn’t really want to build that ugly R4C-based site plan. Sometime he and his sincere new architect are going to have to make connection with the neighbors again, and figure out how to coordinate their planning with the historic district processes now underway. When asked a pointed question about how he would fit his timeline into those processes, he was not really able to answer. But he says that he hopes to have a new proposal by the end of the month (October??? I’m glad I’m not the architect). Another question is simply the economic viability of the project. Will the reduced number of bedrooms and meticulous preservation of historic structures, for which rents modest enough to qualify as “workforce housing” will be charged, be sufficiently profitable? The actual rental amounts have not been stated, but if young professionals like the Google employee recently profiled in Concentrate are going to rent those nice units, there will be an affordability problem. According to HUD income figures and guidelines, the annual median income for single people in Ann Arbor (2008) is about $56,000; “workforce” is often defined as about 80% of the AMI, which is about $43,000. Total housing expense of $1,076 is thought to be affordable at that income level. Concentrate’s blogger, Kate Rose, is looking for something under $1000. If everything works, de Parry’s new concept should fit her just fine. I hope that they can afford each other. UPDATE: Tom Whitaker helpfully pointed out that I should have said the standards to which renovation will be done are the Secretary of the Interior’s standards for rehabilitation. Mr. Dziurman did in fact reference these but I wasn’t familiar with them and didn’t want to take time to find supporting information, so conflated them with the National Register, which he also mentioned. Thanks, Tom! A neighborhood meeting will be held at 6:30 PM on December 14, 2009 at the Ann Arbor Public Library in the second floor meeting room. Preservation architect John Dziurman will present our “Heritage Row” plan that has incorporated community input and comments received at our previous neighborhood meetings and one that also meets the Secretary of Interior’s Standards for Rehabilitation. 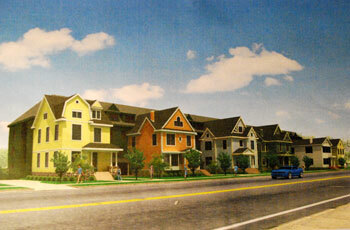 All seven of the existing houses will be rehabilitated and the existing streetscape will be preserved. Our design for the rear of the site consists of three separate, free standing 3.5 story buildings similar in scale to the “Washtenaw” apartment building located one block east on East William. Underground parking will be located on the rear of the site underneath the three new buildings. A plaza area will be located behind the existing houses in the center of the site. THIRD UPDATE: The project is now called “Heritage Row”. They have a website. FOURTH UPDATE: The Chronicle’s report on the roll-out of Heritage Row is here. FIFTH UPDATE: The study committee has now recommended a historic district and set projected boundaries. See the AnnArbor.com account here. NOTE: An updated post (2011) is here. This entry was posted on October 13, 2009 at 5:46 pm and is filed under Neighborhoods. You can subscribe via RSS 2.0 feed to this post's comments. You can comment below, or link to this permanent URL from your own site. Thanks for your well written, third-party observations of the meeting. The standards that would need to be followed for any project in an historic district would be “The Secretary of the Interior’s Standards for Rehabilitation.” (The National Register is simply a listing of historic properties that meet certain criteria.) The Standards can be accessed on the National Park Service website which includes detailed and illustrated guidelines to help interpret the Standards. This criteria is also used by State and Federal agencies in evaluating tax credits for approved rehab work done on designated properties. Since the moratorium does not stop the project review process, I wonder how this new PUD will be handled by the City in terms of a review of the impact to the historic resources. After the district is created, any project would need to be recommended for approval by the Historic District Commission. Will this new PUD run through the normal approval process (staff, planning commission, and city council) and bypass the HDC? Or, will it be sent back to the HDC, after the fact, once the district is established and the moratorium is lifted? I don’t know if this issue has come up before, but I hope the City Attorney is looking ahead this time. Thanks – actually I was a little lax in my reporting because the architect said he was referring to the Secretary of the Interior’s standards. I wasn’t entirely comfortable with where those were referenced so didn’t mention them, but he did say a couple of times that he was consulting them. I appreciate your backing up that reference and linking to it. This statement had me laughing out loud. From my experience, this is exactly the range of experiences that most people have while dealing with Mr. de Parry’s development-related activities. I’m pleased to hear that a new architect is involved, but this new preservation-focused development gambit is likely not the end of Mr. de Parry’s story with regards to the future of these properties. I hope something can be worked out here like was done with reaching an agreement with Near North, mostly because I’m worried about a lawsuit over the historic district moratorium. I’ve heard legal arguments say there is a case and some say there isn’t, so it seems like a roll of the dice to me. If de Parry and the neighborhood can find some agreement here we could avoid that gamble. Yes, I confess that I would like to believe that this latest proposal can find traction, if good faith can be re-established between the parties. If I heard right, this is very similar to what the neighbors were proposing some months ago. An excellent, well-written, informative, somewhat dispassionate reporting back from what must have been a cozy meeting with few (only two) Germantown silent observers. I am for preserving the neighborhood and the historic homes and trust things will indeed work out well for both houses and residents. May I suggest that the name City Place be scrapped, as it by now is slightly inflammatory, and replaced with something more of a Germanic flavor? Bob, that is a very useful suggestion. Thanks. We did try to think about something “Germanic”, but most of the original people who built or lived in these houses were not German. Beakes Place, Fifth Avenue Apartments, Hamilton Apartments, some of the names that have been suggested…any ideas you or anyone else may have would be appreciated.Thanks.